Safir (Satellite for Information Relay) is a global, satellite based, bi-directional communication System for digital data transfer. The Safir service aims at non real-time exchange of data and messages to and from objects equipped with small and inexpensive User Ground Stations. Additionally, the Ground Stations can be equipped with a GPS (Global Positioning System) receiver for position determination of the object. Safir-2 is an autonomous free flying communication satellit and is a further development fo Safir-1, which was a fixed payload on Resurs-O1 1. The most advanced technological innovation on-board Safir-2 - besides the basic telemetry system (TDMA) - is a Frequency Hopping telemetry system (FHT). This technique allows 16 user stations to transmit within the same time slot in the same frequency channel. By means of this technique, the total throughput of the SAFIR 2 FHT has been increased by a factor of 16 without any loss in data security. 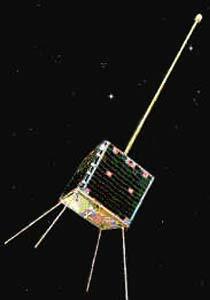 SAFIR-2 has been in orbit since July 1998.